Heartbeat joke! BOOM! Who else is doing that in 2011?? Currently listening to : America "Horse with no name"
Hours after finishing this comic strip my girlfriend found an electronic cigarette on a wall and gave it to me. It has teeth marks around the business end and the LED blinks. It's washed but may still be haunted. Currently listening to : Pregnant "Dog", my music video directorial debut! New depths. Flesh & Bone fans! 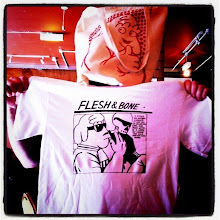 Please note the monetising merchandising options to your right hand side of this screen, you can now pick up a Flesh & Bone t-shirt or tote bag online! Click the links to get kitted out. What else, my food blog FOOD LEGEND has been nom-nom-nominated for a Manchester Blog Award in the Best Personal Blog category at this year's Manchester Blog Awards. Blogging hell. Didn't see that coming. You can vote online here before the 10th October. Currently listening to : The Replacements "I'll be you"